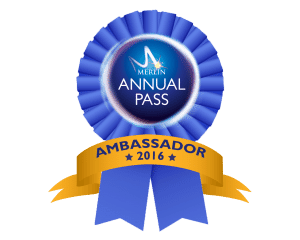 We are Merlin Annual Pass blog ambassadors for this season, and so this half term we are going on a bit of a Merlin binge. 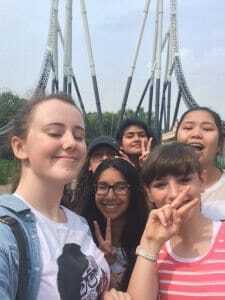 Thankfully my eldest child is now 13, and as we live very near Thorpe Park and are very familiar with it, I am comfortable for her to go there on her own with her friends. It is the teenage hangout of choice for many local people and I think the whole park has a lovely family atmosphere. For them it is a taste of freedom – they don’t need to carry too much money and there is plenty to do in a friendly supervised environment. Also quite a few of my daughters friends elder siblings work there, and she is almost guaranteed to meet somebody she knows. I’m quite pleased too that I don’t have to go on all the rides with them any more. I used to enjoy roller coasters when I was younger. I’m not sure whether I have got more wimpy or the rides have got more scary but I’m afraid I don’t get the same amount of enjoyment any more. I enjoy the water rides and some of the medium scary rides, but I do find some of the rides at Thorpe Park take me beyond the realms of excitement and terrify me in a way that doesn’t feel good. My 11 year old son is also a bit more cautious and hasn’t taken to the big rides yet in the way my daughter has – he is still much more of a Legoland or Chessington World of Adventures fan and hasn’t really embraced the full potential of Thorpe Park. Don’t get me wrong – there is a huge amount for younger children to do at Thorpe Park. We used to go regularly when the children were aged 3-5 and there are more than enough family-themed rides and attractions to keep younger ones entertained all day. But once children get past the 1.4m height barrier, I have noticed that all they seem to be interested in, is testing whether or not they and their friends are brave enough to go on the big rides, and the smaller more friendly rides don’t get a look in. Now that all my children are in the big rides category we have a slightly different experience at Thorpe Park than if we were a mixed age family. So on this occasion our review will be mainly pictures, as I’m pleased to say I wasn’t there. I dropped the girls off at around 10am and arranged to pick them up around 3. There is a great drop off and pick up area and it was easy to meet up with them again when they came out of the park. If you don’t live within driving distance, the bus service from Staines station is fairly regular and very good. I would happily send my teenagers on it. 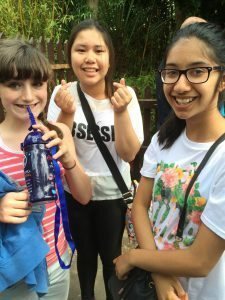 We used some more of the bring a friend for £10 passes to get some of the girls in – others had brought Tesco vouchers or had Merlin Passes of their own. We received four Premium Annual passes as part of the Blog Ambassador programme, and each Premium Pass comes with 3 bring a friend for £10 vouchers, so my children have been very popular with their friends this year. Once they were inside my daughter was able to use her annual pass to get discounts on drinks and on their lunch. 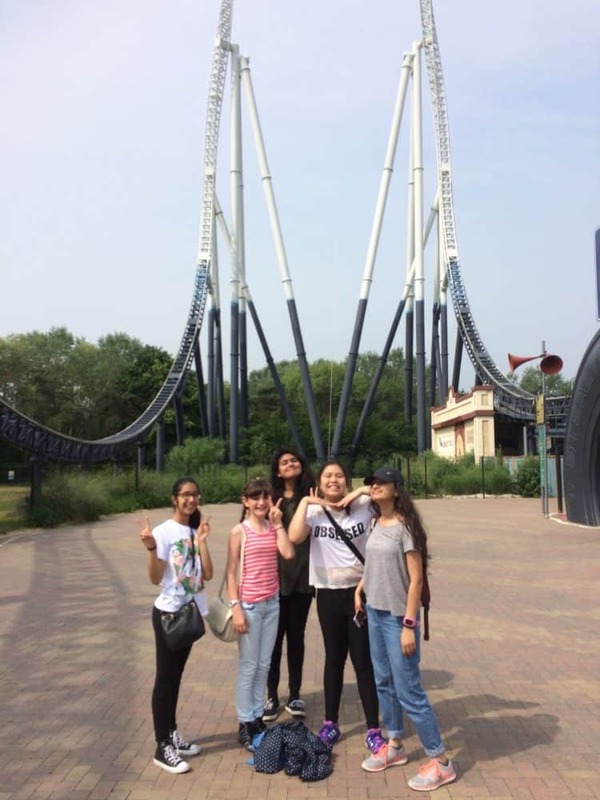 They had a fabulous time, going on Stealth, Nemesis, X, Colossus and many more rides, yet still had the stomach for a full lunch. Getting there early, they were able to do quite a few of the rides before the queues built up. 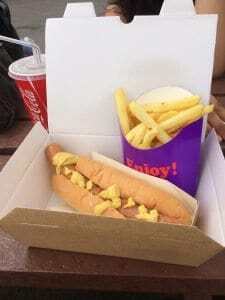 Because the girls had to leave the park at 3, we didn’t really get to try out the Halloween offerings at Thorpe Park. There were plenty of decoration and staff/actors in scary costumes, but I suspect that the park really comes into its own on the Fright nights. This year the park is open from 10am to 10pm for the entirety of half term week, and the special Fright Night attractions start from 3pm. There are five different horror mazes with live actors in them, designed to scare the wits out of you. Some local teens report that this is amazing – mine are of a slightly more nervous disposition and have opted to stay away. In conclusion, I really love the fact that we live so near Thorpe Park and we have visited it a lot over the years. I think it offers a huge variety of experiences and has something for all ages. For our family right now, it is amazing for my teenage daughter and friends by day, but a little bit too scary by night, although I know lots of families with children younger than mine that really enjoy the Fright Nights and go every year.